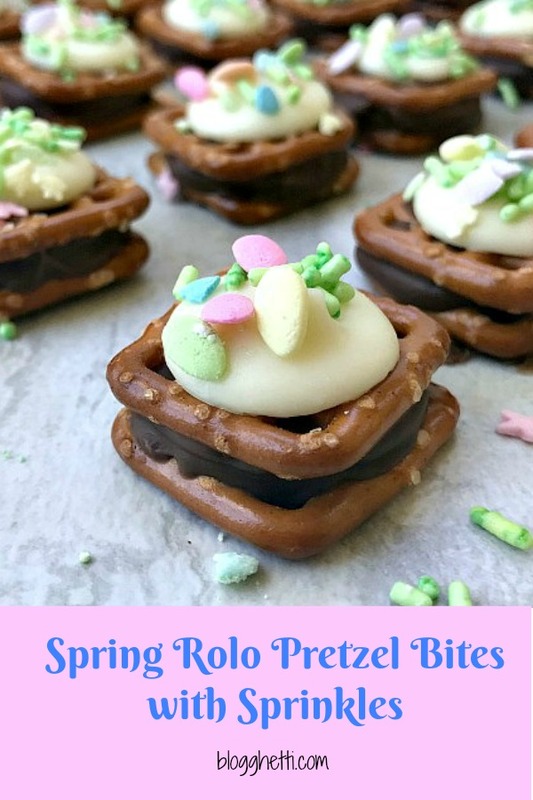 Spring Rolo Pretzel Bites are perfect the perfect sweet and salty treats. 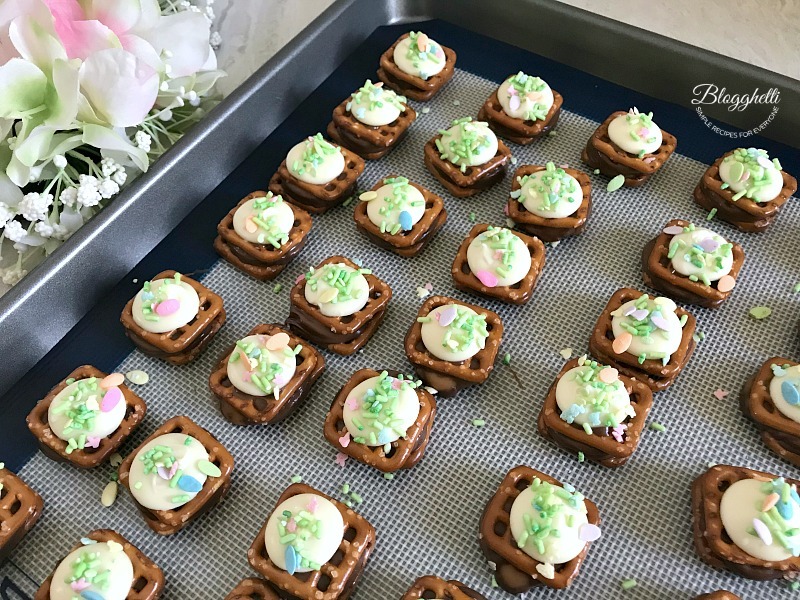 These little pretzel bites are fun to make and perfect for gift-giving or party trays. Do you love sprinkles? I sure do and if you saw my pantry, you would think I am nuts. I can’t resist cute sprinkles for any holiday or just because reason. If I could get away with it, I’d probably add sprinkles to some dinner entrees. Ha! We’re deep into #SpringSpringsWeek and I’ve got sprinkles to share with you today. SprinklePop generously sent me some adorable spring sprinkles to use. They are also one of our amazing sponsors for the week. 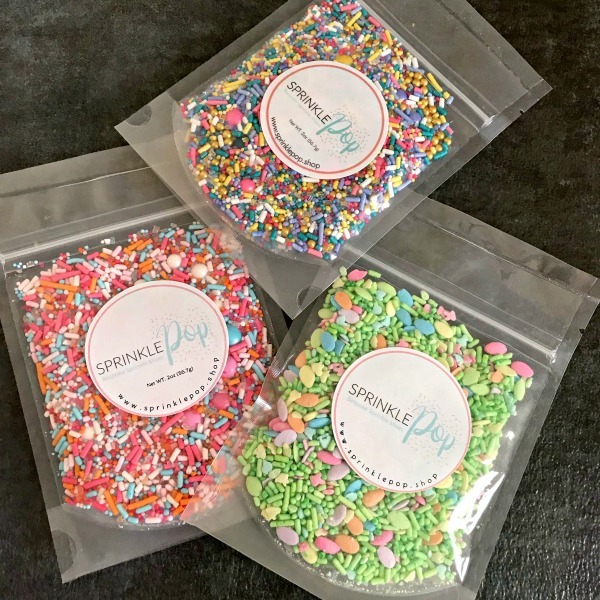 I received three kinds of sprinkles (so fun! ): Soberto Sprinkle Mix, Bewitched Sprinke Mix, and Cottontail Confetti Sprinkle Mix. 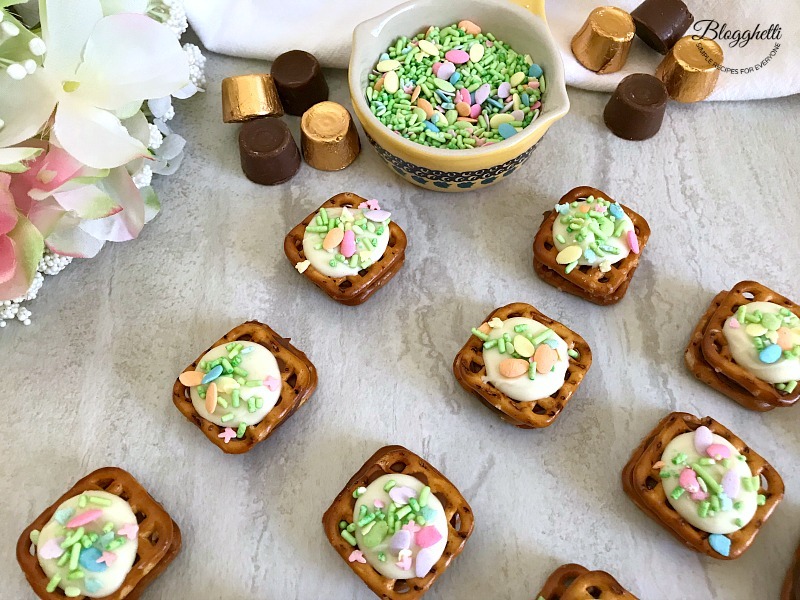 I decided to use the Cottontail Confetti Sprinkes for these cute Spring Rolo Pretzel Bites and I do think it was a good choice. These sweet and salty candy treats are so fun to make and super easy, too. Grab the kids to help you make them! 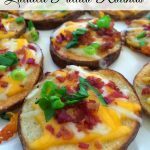 Five ingredients and a few minutes in the oven is all it takes for these to be ready to munch on. Beware – they are addictive. 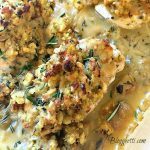 Lining your baking sheet with a silicone mat or parchment paper makes for easy cleanup. Have fun changing the sprinkles to match party themes, holidays, or whatever you like. 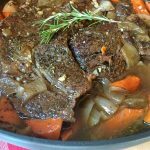 The oven times are perfect for most ovens, but every oven is different. If unsure, do a couple pretzel treats to judge the exact times. 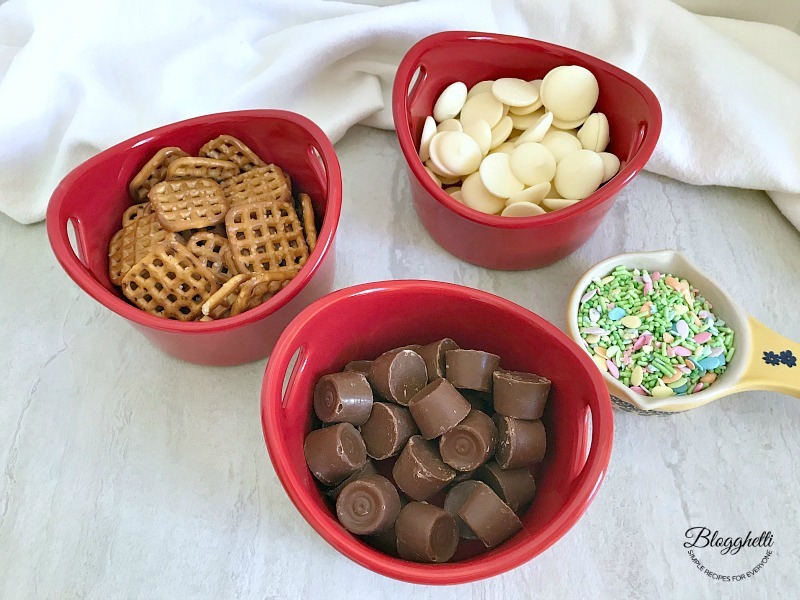 Refrigerating the Rolo Pretzel Bites will speed along the hardening of both the Rolos and white chocolate. 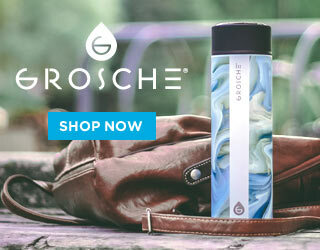 After this step, you can store them in an airtight container. 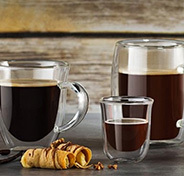 You’ve been warned: they are addictive. Preheat oven to 250 degrees. Line baking sheet with a silicone baking mat or parchment paper. Place pretzel squares flat on a prepared baking sheet. Place a Rolo candy on top of each pretzel square. 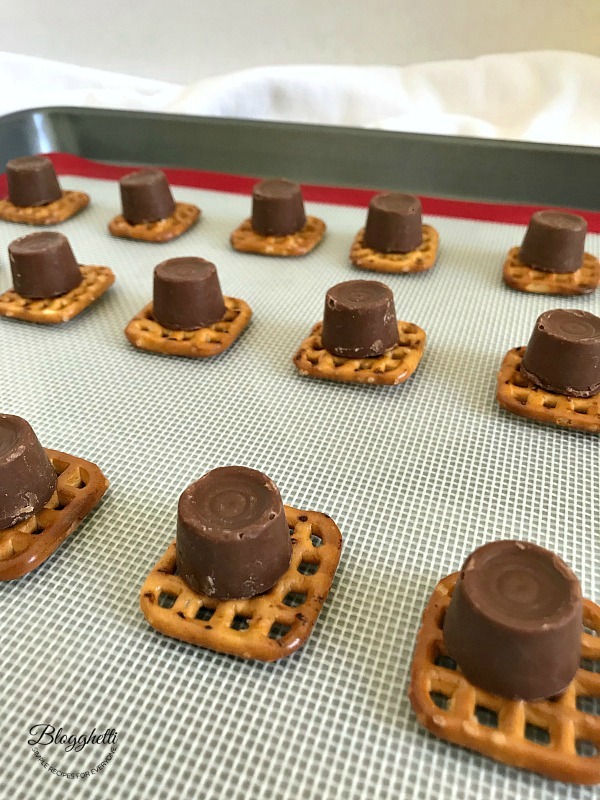 Remove pretzel bites from oven and gently press another pretzel square on top of Rolo candy, sandwiching the it between the two pretzel squares. 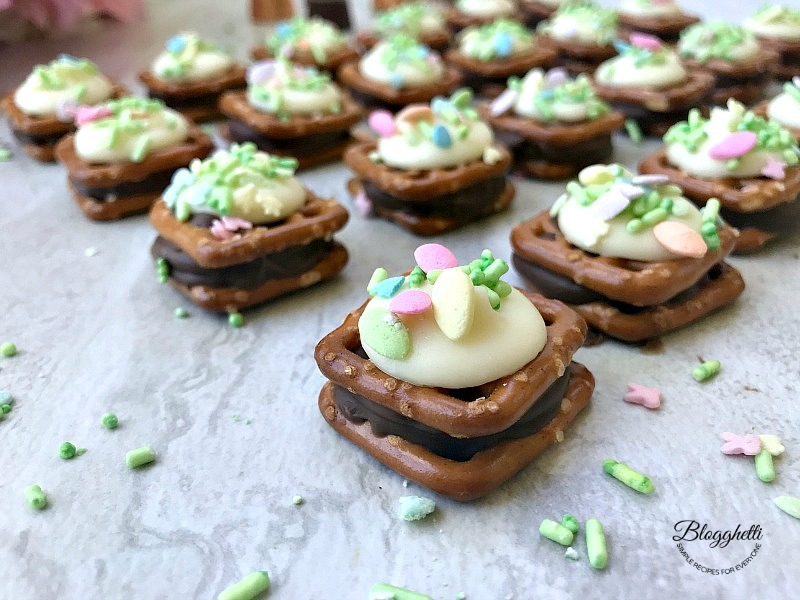 Place a white chocolate melting wafer on top of the each Rolo pretzel bite. Place pan back in oven and bake 3 minutes, or until melting wafer is shiny and soft. It will retain its shape. Remove Rolo Pretzel Bites from oven and immediately top the white chocolate wafer with a few sprinkles. 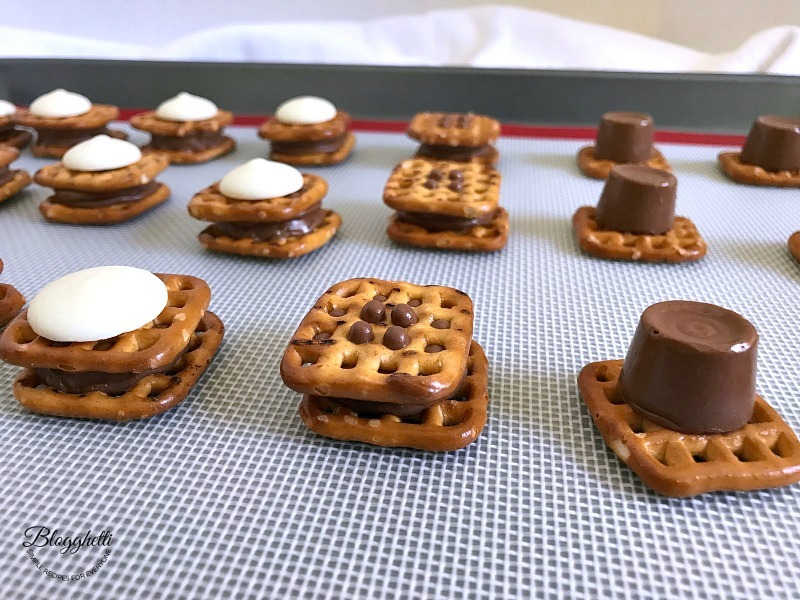 Place baking sheet with Rolo Pretzel Bites on it in the refrigerator for 15 minutes. Then remove and store in an airtight container. Sweet/salty treats give me the best of both cravings at once! I’ve never made or tried Rolo bites, but you can bet that will change. They look delicious! And caramel + pretzel = delicious! Perfect recipe right there. 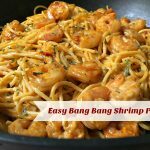 Easy peasy and delicious. Not to mention how fun they are. 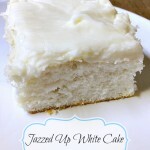 The perfect easy spring sweet! I love that these are double decker and the sprinkles are super cute! These sound delicious! I love the chocolate and caramel with the fun sprinkles! I love those sprinkles! And these sweet and salty treats would be a big hit in my house! I love these adorable bite sized treats. Winner! Ohhh girl, I have a sprinkle problem too. I have literally BASKETS full. Maybe if I could add sprinkles to dinner, I’d go through them a bit quicker! 😉 These pretzel Rolo bites sound like the perfect sweet & salty snack! So easy and cute too! I like that you used the candy wafers. Great idea! These little candies are great- perfect to pop in an Easter basket! 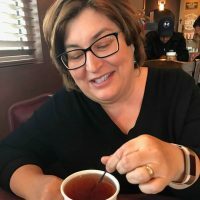 I love bite size treats – especially ones that involve chocolate and caramel. And the sweet & salty combo is perfect! I sometimes make pretzel bits with hershey kisses and M&Ms or sprinkles and they’re a huge hit. This is a great twist. My family would totally eat these up! I love the flavors of the pretzel and rolo candy! The sprinkles look amazing! Super cute!